We recently met Chevy introducing some basic information related to its upcoming Traverse. 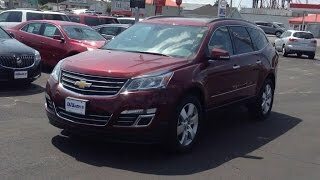 Well the company didn’t make it much long to present us entire production model of Chevrolet Traverse LTZ 2014. 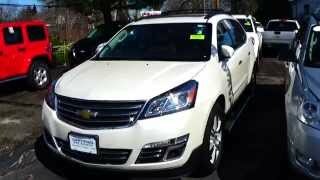 Bringing inside lot of space and great towing capacity, the all new release is housed with better features and adored with complimenting looks, which hearing from company are tagged as ‘irresistible’ Let us have a look at the review of Chevrolet Traverse LTZ 2014 and get to know more about this new release from New York Auto Show. Interior of Chevrolet Traverse LTZ 2014 is highly spacious and comfortable. Offering cargo space of 116.3 cubic feet once you remove the third row and fold the second row; however the standard space with all seats standing is 24.4 cubic feet. Apart from this company also kept in mind introducing some technological upgrades and this came by mounting dual USB ports for device charging at the rear part of center console. This isn’t the end as company has used high-end materials in making the rich and luxurious interior of Chevrolet Traverse LTZ 2014. The luxurious integration gets the remarkable accent of silver accompanied with blue ambient lighting. Center console come dipped in wooden trim across its 6.5 inch LCD touch screen allowing you to connect and operate hands free calling and other features. Exterior of Chevrolet Traverse LTZ 2014 also gets the revision in its design language. We won’t say it’s a completely redesigned package but yes it is sufficient enough to take a step ahead of its predecessors. The look remains same while changes come through a three bar main grille and two lower bar grille making its place over nose by replacing the traditional honeycomb grille. The headlights too get part of redesign through wide elongated look. Beneath them sits fog lights beside the tiny air vents that supply fresh air to brakes. The hood too gets bit of style and replaces the old bland hood. 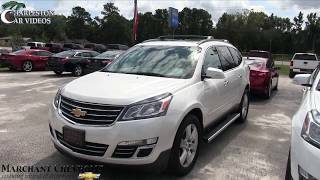 Moving towards the rear fascia of Chevrolet Traverse LTZ it’s again the taillights which get improvised look and replace the ancestor trend. This new amalgamation sit above the new step-style bumper and chrome trim piece that rounds up the stylish exterior of Chevrolet Traverse LTZ 2014. Beneath the hood of Chevrolet Traverse LTZ 2014 remains 3.6 Liter V6 engine generating total output of 281 hp and peak torque of 360 nm with single exhaust and mated to six-speed automatic transmission. However when equipped with dual exhaust the engine generates extra 7 hp and 5 nm of torque.